What Happened to the Segway? When the Segway—the iconic two-wheeled transportation device and frequent punch line of jokes—was introduced back in 2001, it was thought that it could change the world. After the publication of narrative nonfiction book, Code Name Giner, by Steve Kemper, there was a widespread speculation that the personal transporter would become more important than the Internet. Bezos was quoted saying, “…Cities will be built around this device.” Even Steve Jobs is reported as remarking “This will be bigger than the PC”. Yet, thirteen years later and aside from limited quantities of the Segway being used by police forces and hobbyists, the personal transportation device that was supposed to change the world is rarely mentioned outside the context of a joke. So, what happened? Where did the Segway go wrong? The latest fragment of hope for the Segway was back in 2008, the same year that fuel prices spiked to $4 a gallon in June. The company reported all-time high sales, and private dealerships cited 25% improvements in sales as people across the country traded in their gas guzzling vehicles for a more fuel-efficient alternative. That said, these “record-breaking” sales were fractional by even the standards of struggling auto manufacturer, GM. Indeed, according to The Wall Street Journal, by 2006 the company had only sold 23, 500. One of the main reasons for these less than impressive numbers, is that as useful as the Segway could be, its niche was already filled by a cheaper two-wheeled transportation device. The bicycle. Many potential customers saw no need to abandon their bikes for the more clunky and more expensive Segway. There’s also a certain stigma attached to the Segway thanks to the number of media and film tycoons that have mercilessly skewered it, from leading satirical newspaper to The Onion, to The New York Times who labeled it as the “redolence of New Economy foolishness…It’s as though being a responsible adult is a burden of the working class”. Lastly, is the indisputable fact that even when a technology fulfills a need, it requires distribution networks. For instance, roads and parking. Even though Segways are legal in most states, there’s not much room on the roads or the sidewalks, making its use hardly practical—at least not in this day and age. 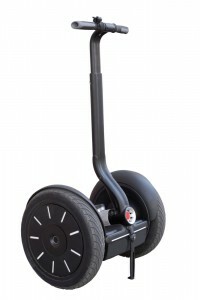 So to answer the question, “What happened to the Segway?” …Well truthfully, not much of anything. But will it ever? Only time will tell, but it should be noted that when the bicycle arrived in the late 19th century, it was just as scoffed at as the Segway is today—so never say never!